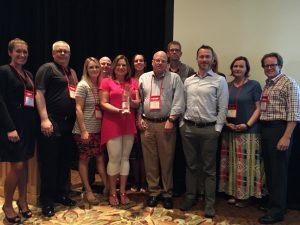 FRISCO, TX – August 23, 2017 – HRchitect, the leading provider of HCM strategic consulting services, has been awarded the Partner of the Year award for 2016 from Ultimate Software. This award was presented at Ultimate’s Global Delivery Summit, a two-day event focused on education, development and recognition for the 27 partner organizations who are a part of Ultimate’s services ecosystem. As a certified implementation partner, HRchitect has been working with Ultimate Software since 2006 and has helped hundreds of companies to successfully launch all elements of UltiPro’s comprehensive platform. In addition, HRchitect has worked with existing UltiPro clients in developing integrations with other HCM systems they may have as well as optimizing their current systems to maximize their investment in Ultimate. For more information about how HRchitect can help your organization maximize return on investment on your UltiPro system, or any other Human Capital Management (HCM) systems, please contact us. As a leader in HCM Systems strategic consulting, HRchitect offers end-to-end HR technology consulting services focused around strategic planning, evaluation and selection, change management, implementation, project management and ongoing support of HCM systems of all types including Talent Acquisition, Talent Management, Learning Management, Workforce Management, Benefits, Core HR/Payroll and more. Over the past two decades, working on thousands of successful engagements for clients of all sizes and industries across the globe, our experience is vast. We have expertise around all major HCM systems including ADP, Benefitfocus, Ceridian, IBM Kenexa, Oracle, Saba, SAP SuccessFactors, ServiceNow, Taleo, Ultimate Software, WorkForce Software and more. HRchitect is a name you can trust for all your organization’s HCM technology-related consulting needs.